[tps_header] Here in Michigan, spring is on it’s way! When I was out shopping this weekend, all the potted flowers were calling my name. I haven’t been able to stop thinking about which ones I want to plant this year, and what kind of planter I want to make to present them in. So…I went looking and found 10 FABULOUS planter ideas, ready to inspire!!! You will just love the creativity–so many clever and darling ideas! Most of these are for planting flowers, but I found a couple really fun ideas for gardens that I added those too. Here’s an idea using an old washtub! I made it a several years ago, and it’s still one of my favorite things for my back porch. It’s also really versatile–I plant flowers in the spring, then pile it high with pumpkins in the fall. LOVE. My wife and I are really into gardening. We’re always looking for new ideas to make our garden a little bit more unique. I think those tiered planters you posted pictures of are a really great way to do that. That’s definitely going to be our next project in the yard this spring. You really gave us some good ideas. Thanks! You are so welcome! I’m glad you found some ideas to try. Thanks so much for stopping by!! 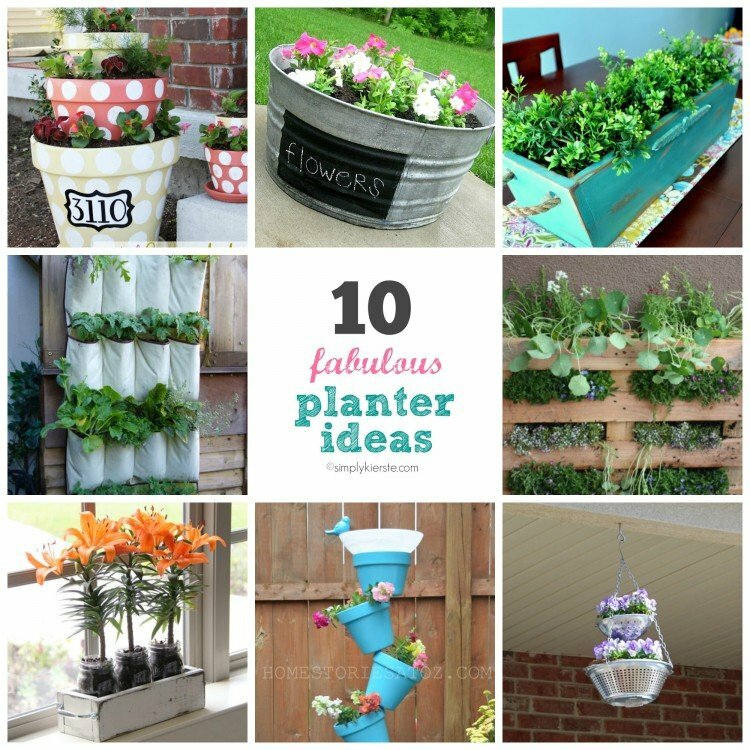 These are some really great planter ideas! That canvas shoe holder one especially, I’ve got two of those just sitting around. And I’m always looking for things to do with shipping pallets, so I may have to try that one too> Thanks so much for writing! Whether you love gardening or not, plants makes everything look cuter. I really love the planter designs and ideas. I am kinda obsessed and looking forward to that mason planter idea, also that rustic planter from lemon tree creations. Thanks a lot for sharing these planter inspirations.